This easy to use COFFEE QUEEN THERMOS brews your coffee directly into a practical 2.2 litre airpot that can be removed from the brewer and positioned where you want to serve the coffee. Capable of brewing approx 15 cups in as little as 7 minutes (15 litres/h) this thermos is perfect for those who want to keep their coffee warm whilst retaining the coffee’s taste and aroma! 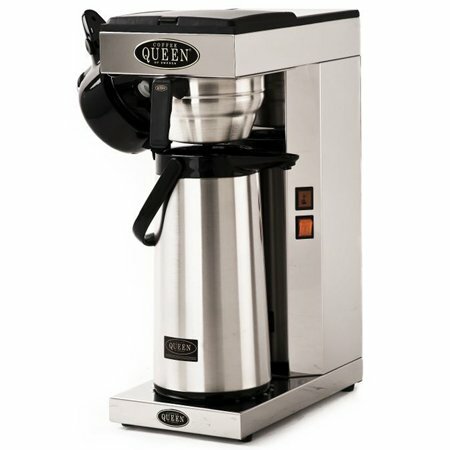 The COFFEE QUEEN ORIGINAL brand is part of a series of classic filtered coffee machines. Machines that for decades, have earned a great reputation in top end hotels and other environments where guests demand a great tasting coffee. These machines are built based on proven technology that has been complemented and refined over the years with new innovations. The results are great valued filtered coffee machines that you can rely on and will be able to enjoy for years and years to come.